EValuate estimating software is suitable for business’ of all sizes, helping you to describe, measure and price Bills of Quantities with as little duplication of effort as possible to produce fast, accurate and consistent tenders. Improved productivity enables you to respond to more tenders, more accurately. 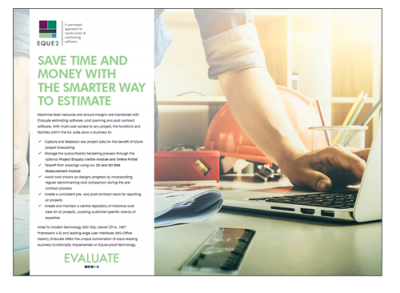 Find out how powerful, resource based estimating software can help you win more work with less risk. 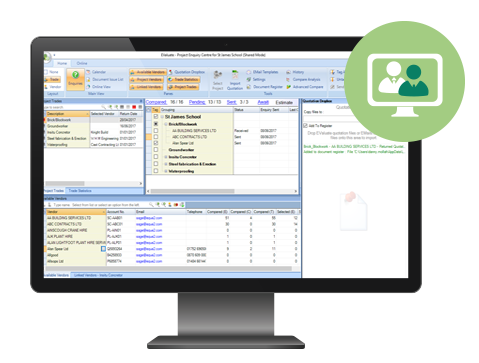 Quickly and easily produce Bills of Quantities manually or populate with content from previous jobs, templates, your own libraries or Laxton’s Priced Libraries. Create and maintain templates or standard ’Takeoff’ jobs to avoid replicating work. Use our flexible project structure to tender against client schedules which contain your own items within them. Import Bills of Quantities from Excel, price them up, then export back into the original Excel format with your rates populated. Dim sheets behind every measured item calculate quantities. Perform a fast, accurate On-Screen Takeoff from all file types, with enhanced CAD drawing and BIM model functionality available. Live Links between the Dim sheet and the Takeoff enable amendments and revisions to automatically update the bill. Produce annotated, colour coded 2D or 3D mark-up, with a legend, to accompany your tender. Build up nett rates from first principles, Laxton’s Priced Libraries, your own libraries or previous jobs. Amend resource rates for labour, plant and materials at the job level. Main contractors can issue enquiries, drawings & revisions to subcontractors, and can collate and analyse responses via an online subcontractor enquiry portal. Make your own adjustments, uplifts, overhead and profit mark-ups by resource or project structure to calculate gross rates. Eque2’s EValuate construction estimating software alongside Construct for Sage Accounts helps SJE manage the entire project lifecycle to ensure their estimates are accurate, contracts are managed, deliveries are recorded, and jobs are delivered on time and on budget. We now have a level of consistency within our business that we never had with Excel. We are able to build and revise our tenders faster, resulting in more wins for the business. I went from working 6 ½ days a week to 5 days a week, as tasks that would typically take around 12 hours now only take 10 minutes in EValuate.